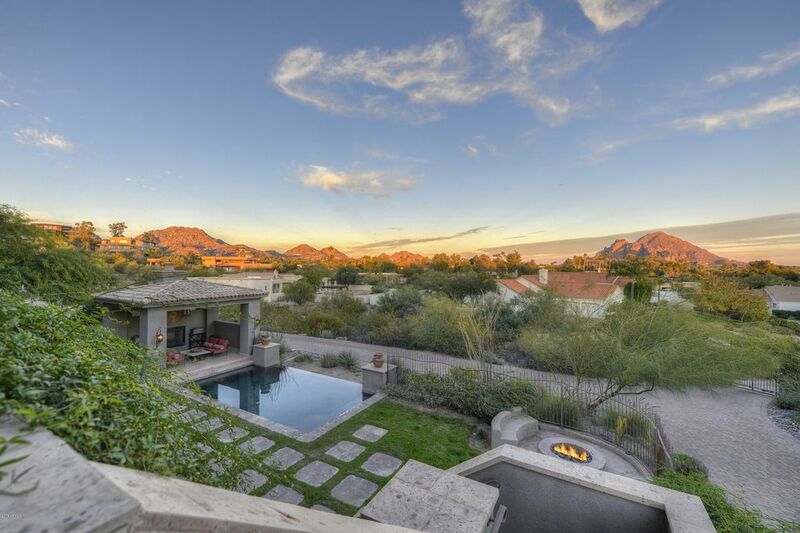 In a prime Paradise Valley location close to all the amenities of the Biltmore Fashion Square, at the end of a quiet cul-de-sac, you will find a beautiful wrought iron gate which opens to the private driveway winding up to this lovely two-story Mediterranean Hillside Villa. Built with the utmost of care using the finest of finishes such as Cantera fireplaces, natural wood and stone floors, granite counter tops, various differently designed ceilings, a courtyard style entry with an impressive wrought iron front door and soothing sliding water fall all capturing that sought after Southern European ambience. The home itself offers an extremely desirable and expansive floor plan perfectly suited for gracious living including a large living room with fireplace and beautiful views, formal dining room, large Chef's country kitchen opening to the family room, butler's pantry, study and wine room plus two master suites all on the main level. Additional bedrooms, home theatre, game room, workout room and more are at the level below. An abundance of large French doors throughout the home capture the stunning mountain and city light views as they open to various terraces and covered patios including one with an outdoor kitchen and a cozy fireplace. Easy access to the stylishly landscaped pool area with a large comfortable ramada offering that ultimate relaxed and enjoyable Arizona indoor/outdoor lifestyle. Truly a rare find! Directions: South on 32nd St to Camino Sin Nombre. North on 32nd Pl to cul de sac.